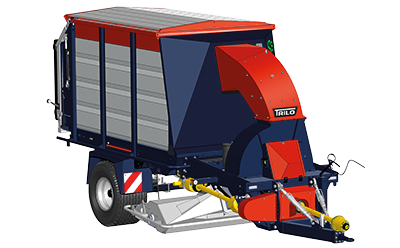 Manoeuverable vacuum sweepers with a bin capacity of 8 to 12 m3. Despite their compact size, they have a large bin capacity that reduces the time of driving back and forth to and from an unloading location. A powerful fan in a housing with a replaceable lining ensures a high working speed. The vacuum sweepers have a working width of 2.1 to 3 m. To order to save weight, all large vacuum sweepers are equipped with an unloading floor that can be emptied quickly and easily. Large vacuum sweepers are driven by a PTO drive shaft attached to the tractor and require an output of The required hp PTO can vary depending on the working conditions.75 – 110 HP (55 – 81 kW). Extra wide radial tyres and an optional swing axle with four wheels in line, ensure a very low ground pressure.